Compared to most advanced economies and despite a volatile global economy Australia’s economic performance has been remarkably good over the last few years. Australia‘s economic performance has been remarkably good over the last few years compared to most advanced economies and despite a volatile global economy. This was due mainly to a persisting mining investment boom, driven by high demand: especially from China. However, GDP growth slowed in 2013 to 2.4 %, compared to 3.6 % in 2012, as the economy faced headwinds from a decline in both mining and non-mining investment, lower growth in consumer spending and the high Australian dollar. Mining investment is expected to decrease further, with the pace of decline accelerating in the period 2014-2016 as large liquefied natural gas (LNG) projects move towards completion. In contrast, housing and consumer spending picked up in early 2014 and non-mining investment is recovering, at least tentatively. In addition, in the first quarter 2014 exports increased sharply. The Reserve Bank of Australia has kept its benchmark interest rate at a record low of 2.5 % since August 2013 in an attempt to spur a fresh wave of economic growth, especially in the non-mining sectors. 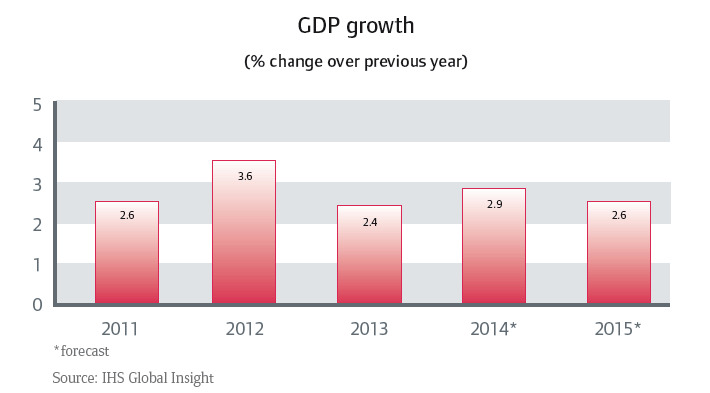 GDP growth is forecast to increase 2.9 % this year and 2.6 % in 2015 (see chart below). The Australian economy is in a transitional phase: investment in mining is reducing while production and export of bulk commodities like iron ore, coal and LNG are booming and making an increasing contribution to growth. However, this will not be enough to return the economy‘s growth rate to its earlier trend: a recovery in non-mining investment will be needed to deliver long-term and sustained economic growth. Consumer confidence surveys showed above-average confidence levels in Q1 of 2014, but a sharp decrease in May and June to a level well below the long-term average. This was due mainly to announcements of Federal Budget expenditure reductions (welfare, public services) and tax increases, although consumer confidence is expected to rebound in the months ahead. The Reserve Bank’s low interest rate monetary policy has supported household consumption and housing construction in 2013 and into 2014. The Bank has indicated that this stance is likely to continue, particularly as inflation is benign. Unemployment rose from 5.2 % in 2012 to 5.6 % in 2013, as the structural transition from mining investment to mining exports has created an element of frictional unemployment that will take time to absorb. Unemployment is expected to rise moderately this year: to 5.8 %. 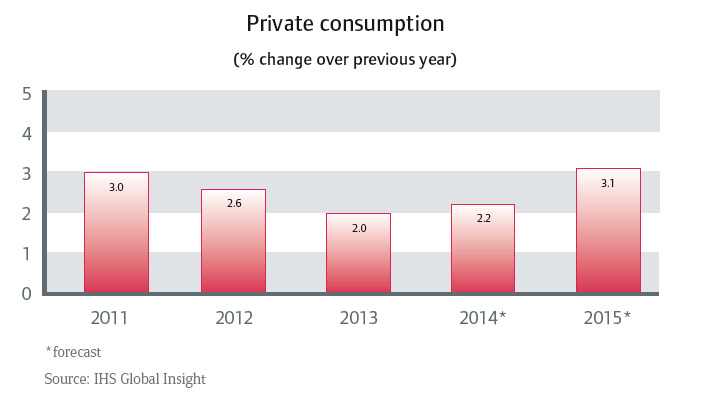 Private consumption grew moderately in 2013, by 2 %, and growth of around 2.2 % in 2014 and 3.1 % in 2015 is expected. The mining sector has been the driver of high growth in real fixed investment - 7.7 % in 2011 and 8.6 % in 2012 - but there are clear signs that it is no longer contributing to growth, as mining investment reached its peak in late 2012. The pace of the decline is expected to accelerate as mega-LNG projects move towards completion, with mining investment falling 14 % in 2014 and 22 % in 2015. While there was a modest increase in non-mining investment in early 2014, many businesses are still deferring investments until they see a sustained improvement in demand. 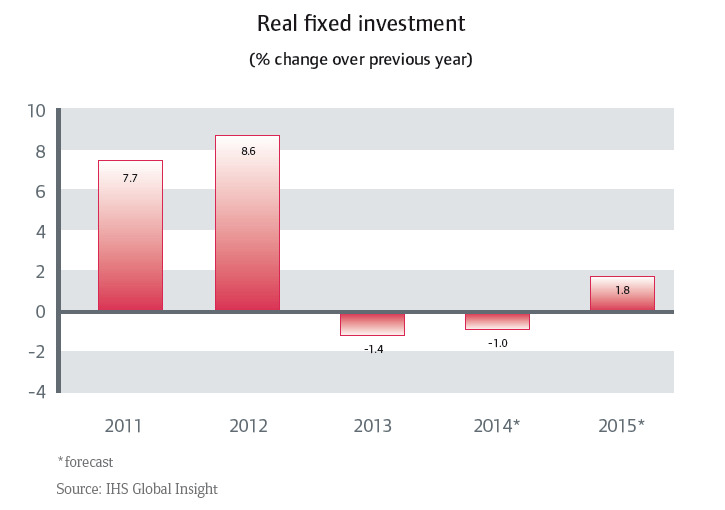 Therefore, real fixed investment is expected to decrease again in 2014: by 1 %. The Australian dollar (A$) rose against the US$, as Australian mineral export prices for iron ore and coal increased between 2009 and Q3 of 2011. However, despite the fall in mineral prices from the end of 2011, the A$ has remained stubbornly - and historically - high for various reasons, including increased portfolio investment (as Australia is considered a safe haven), the relative strength of the Australian economy and the gap between domestic and foreign interest rates. The relatively high A$ has hit Australia’s tourism industry and export demand for its manufactured goods and educational services. Moreover, domestic manufacturing has found it diffi cult to compete against imports, with domestic steel and car manufacturing in particular suffering. 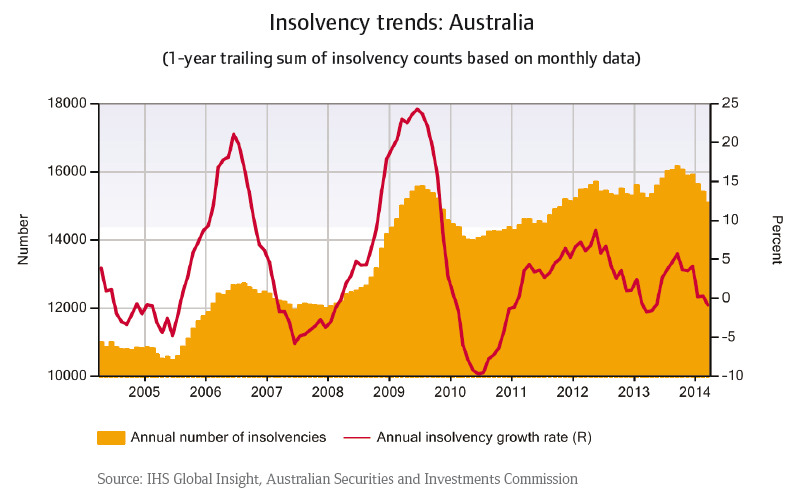 Business insolvencies increased sharply in 2008 and 2009, despite Australia largely managing to escape recession, and have remained at an historically high level since then. The number of bankrupt fi rms is currently one third higher than in 2007 (see chart below). Australia’s fi scal year (FY) runs from 1 July to 30 June. 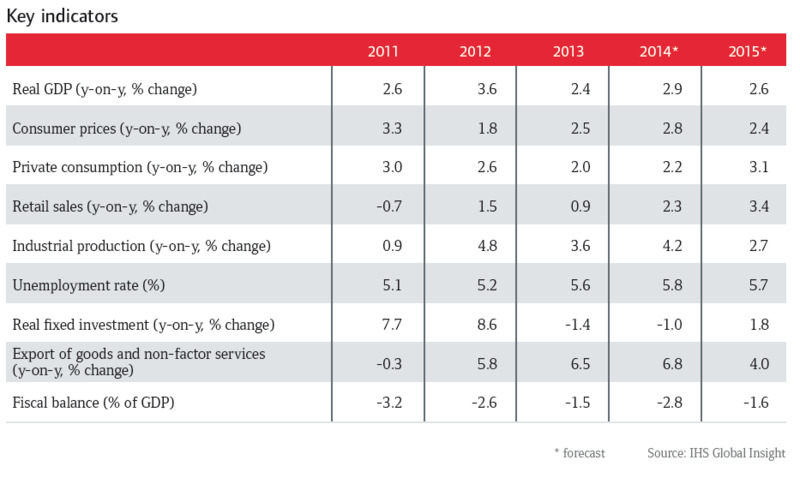 Business insolvencies are expected to decrease slightly in FY 2014 after levelling off in FY 2013. 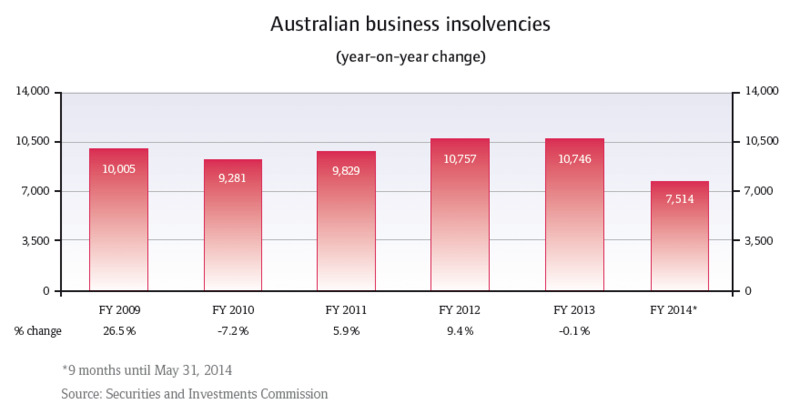 The number of insolvencies decreased 5 % year-on-year in the nine months ending March 2014. Weak consumer sentiment continues to add pressure across all segments of retail. The expenditure reductions in May’s Federal Budget resulted in a decline in household spending and, while sentiment is slowly recovering, it is expected to take the best part of the coming year to get back on track. Consumers are still focused on reducing their household debt and saving ‘for a rainy day’, with concerns about employment and job prospects coming to the fore. As we had expected, our recent claims experience is relatively stable but reflects a number of smaller company failures. Business failures continue to be mainly in electronic goods and furniture retail and are generally low level compared to the high profile failures we saw a few years ago. The market has rejected intense price discounting in favour of preserving margins: using service as their sales tool and improving online offerings to compete against cheap imports. In non-residential construction, major companies are expecting a decline in total construction work this year and next, due mainly to decreasing resource-related construction. However, the extent of the downturn will be moderated by continued growth in telecommunications investment, commercial and transport infrastructure construction. In the residential construction subsector the amount of building work is forecast to grow strongly over the next three years after its solid pick up in 2013. The underlying assumption is for continuing lower interest rates and strong population growth. Current issues in the Australian mining sector are the end of the mining investment boom and declining commodity/metal prices. It is clear that the mining investment boom that has benefited Australia for at least the last five years has come to an end and this will have a negative impact on service providers to the sector, such as mining contractors. Others that hadbeen servicing the mines – such as the small airlines that carry miners, restaurants, hospitality and food servicing companies – are also feeling the pinch, or will do soon. Australian mining companies are also in the process of adjusting their businesses to lower commodity/metal prices: in particular, prices for coal, gold and iron ore have decreased during the last 12 months. High cost or single ore mining companies are expected to come under increasing pressure. The main area of concern is printing, which continues to experience difficulties as the industry adjusts to the move to digital communication and excess capacity in the market, despite recent consolidation. However, although the printing industry has seen a number of business failures over the past six months, our close monitoring and in-depth knowledge of the market has steered customers away from financial loss. Australia’s ICT sector continues to perform well while the IT market in particular is expected to have considerable medium-term growth potential.